Blessing Bricks. Choose any ONE brick for $12. 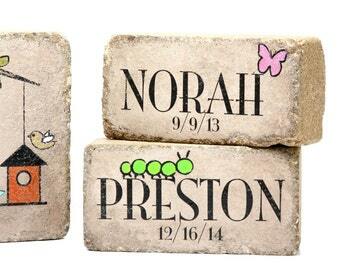 These sweet little bricks are sure to bring a smile to any face and a light to the day. 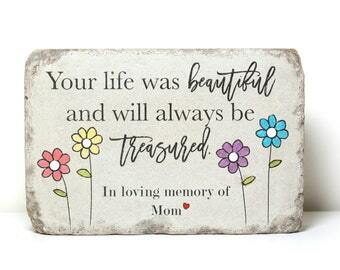 Give them to Mom, Dad, Daughter, Son, Sister or Friend. Bring them to a baby shower or give as a Valentine.....lots of uses for these sweet little bricks. Stack them by books or leave them individual to create the perfect message. They are fully sealed and are ready to be used inside or outside year round. Tuck them into your garden, use as a paperweight or hide them in an unexpected place in your home, they are sure to bring blessings. Mix and match these Blessing Bricks to make the perfect combination. Each stone is made with a variety of inks and paints and has the signature concrete "wash" that allows the words and the colors to "pop". **CANADIAN CUSTOMERS: BUY up to 6 for the same ($43) shipping cost. Choose your QUANTITY at checkout and then leave your choice(s) of stones in the notes section. Choose from ANY of the BLESSING BRICKS in the shop. They are listed below. Ideas for others welcome. Packaging: Each will come with a beautiful silver ribbon and free pads for the bottom so they are ready to gift and be placed in their "perfect spot". If you are looking for something unique, this is a Blessing and Light original and you won't find them anywhere else. In a RUSH? Choose RUSH MY ORDER at checkout and they will get made within 1-2 days. With almost 30 to choose from, feel fee to mix and match from any of the Blessing and Light BLESSING BRICKS listings to make the perfect combination for your occasion. be a blessing. be a light. Child Bookends / Rustic Decor / Doorstop. You are my sunshine/ to the moon and back. Concrete bricks with sweet messages. READY TO SHIP. Add-on of NAME stone ONLY. This is for a Name Brick at a later date or when you just need the small name bricks. Rustic Decor. Garden Stone. it's all about LOVE. Garden decor. Bookend. Wonderful, as always. Thank you! All of the bricks were super cute and unique! Two were gifts and one I keep in my office each as an uplifting reminder. Thanks! Blessing Bricks. 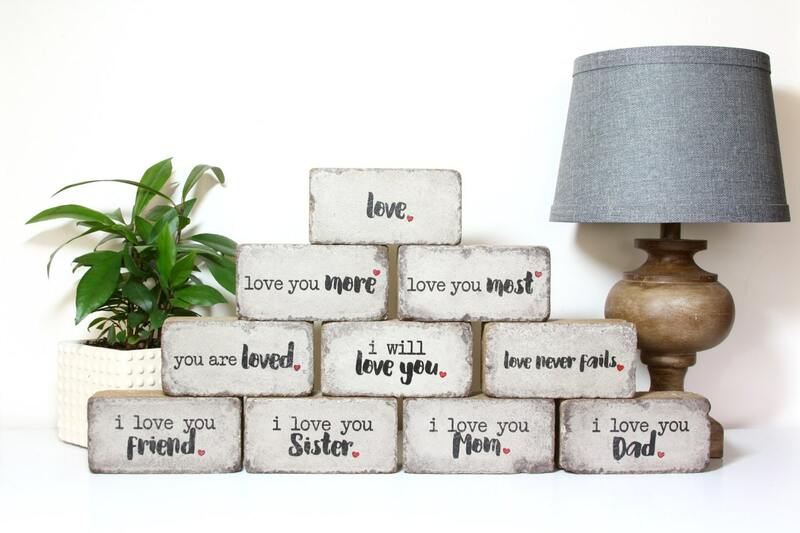 Small Bricks for Indoor/Outdoor with Messages of Love. Gifts for Wedding. Hostess. Teacher. Mom. Dad. Sister. Baby. Love. Rustic Decor. Indoor or Outdoor. 6x9 Tumbled Concrete Paver. Irish Blessing. Irish Poem. Garden Decor. Bookend. Custom Dad Bookend. Fathers Day Gift. 6x6 Rustic Bookend/ Office Decor. Garden Stone. Dad Gift. Personalized Gift. Write your own message. 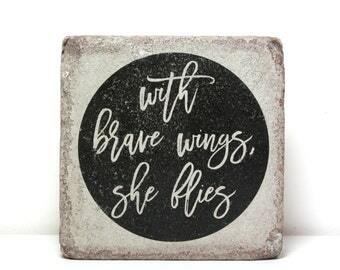 Rustic Bookend or Garden Decor / 6x6 Concrete/ Indoor or Outdoor/ Encouragement Doorstop / With brave wings, she flies. Garden Stone/ Bookend/ Doorstop. 6x6 Rustic decor. Scripture Decor. A Friend Loves At All Times. Proverbs 17 17. Friendship Gift. Rustic Bookend. 6x6 You are loved stone. Tumbled Concrete. Love Bookend, Garden Decor. Love Decor. Wedding Stone. Anniversary.